Fear of starvation within the Inuit population in western Alaska from American and Russian whaling and fishing prompted an interesting solution, introduce reindeer husbandry to the Inuits. Of course you just can’t put an ad in the paper. Or can you? In the end an emigration of not only Samis but reindeer came to Alaska. The introduction of reindeer were first brought to Alaska by the Alaska Commercial Company as a secondary food source for the natives and their outposts. In 1882, four male and eleven female reindeer were brought to Bering Island, just 115 miles off the coast of Russia. The reindeer came from the Chukchi Pensula of Russian and had been kept by the Koryaks. In the first winter two female reindeer were killed by natives but six or seven calves were born. By 1895 the estimates were that there were between 600 and 1,000 reindeer on the island. In 1877 Sheldon Jackson came to Alaska to set up a Presbyterian mission at Port Clarence. In 1884 Jackson was appointed Alaska’s General Agent of Education by Congress. He had been made superintendent of the Presbyterian Board of Missions in Alaska. Captain Healy, of the U. S. Revenue Cutter Bear had an idea that reindeer could be used as a food source for Inuits. Jackson hears this idea and thinks that reindeer could be the solution to economic problems as well. 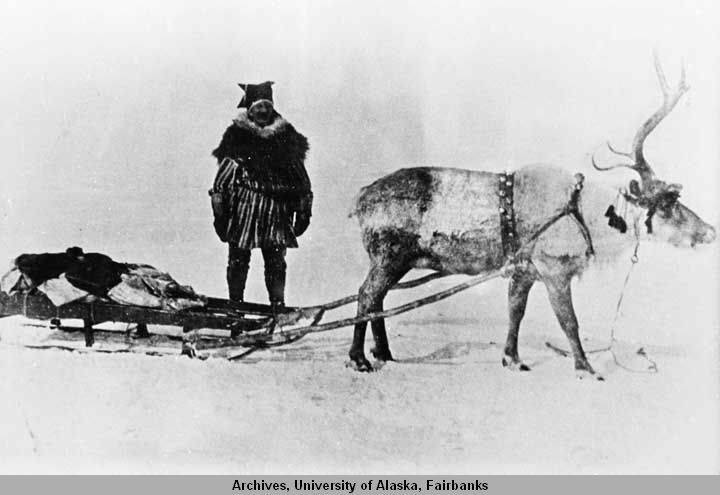 The idea of Inuits raising reindeer was also interesting to the Alaska Commercial Company and several other individuals. In 1891 16 reindeer were brought to the Amaknak Islands in Unalaska, abut 70 miles from the tip of mainland Alaska, to see if they could survive in Alaskan conditions. Fourteen survived the winter and were brought to Teller, Alaska where two calves were born. That summer the Teller Reindeer Station was established only 110 miles across the straight from Russia. Chukchi herders and 171 reindeer were brought in under U.S. contracts. The Chukchi were to train the Alaskan Inupiaq herding techniques. Long time rivalries turned into difficult working conditions ultimately leading the Chukchi to return home. In 1893, the Teller Reindeer Station was in need of new superintendent. William Kjellmann was found after ads were placed in Scandinavian American newspapers. Kjellmann was a Norwegian who grew up on a reindeer farm and spoke Sami. That same year, a second reindeer station was opened in Cape Prince with 118 reindeer to start the new herd. With $6,000 in funding from Congress, Jackson sent Kjellmann to Kautokeino, Norway to recruit Kven herders. Five families and a sole teenager, thirteen men and three women, sign up for the Kjellmann Expedition. The group, along with four children, herding dogs, and sledges, traveled by boat from Finmark to New York they continued by train to Madison, St. Paul, and Seattle, and then again by boat to San Francisco and finally the Teller Reindeer Station. The Sami taught the native Inupiaq and Yup’ik how to milk, lasso and tame reindeer and how to make cheese, glue, sleds, fur boots, harnesses and other items. Each participant in the program received one female reindeer and any offspring. Tribal elders were worried that the young would forget the old ways. At the end of the two-year contracts, only three Sami families returned to Norway. The teenager, Fredrik Larsen and Johan Tornensis and the Nakkala families stayed in Alaska becoming Sami Americans. In 1898, the replacement second expedition, The Manitoba Expedition, left Norway with 539 reindeer and 113 passengers. This expedition included Sami families, six newlywed couples, bachelors, as well as Norwegian and Finnish reindeer herders. The project expanded with reindeer moved to St. Lawrence Island. 1899 reindeer were used to deliver the U.S. Mail between St. Michael and Kotzebue. There was even attempts to use reindeer with search and rescue teams. From 1894 to 1904, Jackson received $207,500 for use on the Reindeer Project from U.S. Congress. Between 1891 and 1902, 1,296 reindeer were imported to Alaska from Siberia before the practice was banned by the Russian Tzar. 1899, the Norwegian Parlament bans the export of reindeer moss, effectively shutting down the export of reindeer. By 1903, nine reindeer stations were in operation with a total of 6,505 reindeer. By 1910 there were 27,000 reindeer in Alaska 1929 Canada starts a similar project. A detailed timeline can be found on the website for BÁIKI: The International Sámi Journal. On the heels of the Great Depression of 1929, a Reindeer Council was appointed with both government and Inuit representation. In an effort to reorganize and regulate grazing areas, Congress passed The Reindeer Act in 1937. With it, only Native Alaskans were allowed to own reindeer in Alaska. The Sami were forced to sell their herds at a loss. The Sami that had married into Inupiaq and Yup’ik families stayed in Alaska. Some returned home. Some moved south to Poulsbo, Washington, to a growing Sami American community. The stories of these early Sami Americans can be found in Ellen Marie Jensen book, “We Stopped Forgetting”. Research on reindeer in Alaska continues today under the University of Alaska Frirbank’s Reindeer Research Program. Reindeer and caribou are the same species. The caribou of North America are Porcupine caribou (R. tarandus granti). The caribou from Scandinavia and Russian are mountain reindeer (R. tarandus tarandus). The later have been traditionally domesticated. In Europe and Asia, both wild and domestic animals are known as reindeer. While in North America it is common practice to only call domesticated animals reindeer.